Yesterday I was watching Exeter Chiefs vs Saracens in the premiership final. During the first half I was thinking about scorelines and how they are constructed and I thought that you could come up with some interesting activities around scorelines. My first thought was “what scorelines are impossible?” – in Rugby Union there are a variety of ways to score, you can kick a penalty goal or a drop goal for 3 points each, you can score a try for 5 points and if you score a try you get a chance at kicking a conversion for an extra 2 points. From this we can see obviously that 1, 2 and 4 are impossible but I wondered briefly if any others were. I don’t think there are as you can make a difference of 1 between an unconverted try and 2 penalties, however that’s not really a strong proof. I may think about how to prove, or disprove, it later. I then thought about the 4 4s challenge, and the variety of related challenges based around the year etc. I thought this might be interesting to attempt with rugby scores. It would be nice to investigate how many ways there are to make each score too, and to see if there were any patterns to it. My thoughts turned to rugby league, the scores in that are 1 for a drop goal, 2 for a kicked goal and 4 for a try, thus all scores are possible, but it still might work for a 4 4s type challenge or an investigation into how many ways each score can be made. I considered other sports too, football would of course be pointless, basketball would provide a simpler version which could be good for embedding the 2 and 3 times tables and that was as far as I managed. Have you considered any of these activities or similar? Do you know of any other sports with interesting scoring systems that could be investigated? I’d love to hear in the comments or on social media if you have. I recently read an article entitled “Flowery math: a case for heterodiscoursia in mathematics problems solving in recognition of students’ authorial agency” by K. von Duyke and E Matusov. It was an interesting article that looked at some student teacher interaction in a lesson where students were asked to solve a mathematical problem dividing one dollar between three people. They had found an interesting exchange between the teacher (“John”) and a student who had approached the problem topologically and has a correct solution using physical coins but hadn’t calculated the amount each person had. This has irked and perplexed the teacher – seemingly because she hadn’t come up to the solution he had in mind. This is an interesting revelation and one that we, as maths teachers sometimes fall into. There can often be many ways to solve a problem in mathematics and all are equally valid. My view is that we need to be looking at solutions presented to us by our students with an open mind before telling them they are wrong. In this case the student had come up with her own approach and had the correct solution – an outcome that feel should be celebrated. The authors use this as a starting point for a discussion on various pedagogies, suggesting that to really allow this sort of maths to thrive in the classroom teachers need to take a dialogic approach – to discuss with the students where their thinking has come from and help them refine their models. They also suggest that the reason John was keen to dismiss this valid reasoning in this case was due to his favouring of a more rigid pedagogical structure. I tend to agree with the researchers. We are there to help students make their own meaning, their own links, in mathematics. Obviously we need to pass on the relevant subject content, but in an open ended task like this it is important to ensure all solutions are explored and refined. This leads me back into a discussion I had recently regarding the purposes of assessment in mathematics which came about from this blog that I wrote on a question with multiple solutions. John R Walkup (@jwalkup) said that we should be assessing all methods to ensure that students can do it. I think that to an extent he has a point. We do need to test that our students can complete the content, and we should be doing this with low order questions where they are directed to practice and recreate skills. However, maths is about making links, making your own links, and solving problems that are unfamiliar – trying the methods you know to see if you can find a solution to a problem, you have never seen. It is the latter that is increasingly being tested in our terminal external exams in the UK as we move to the new specification GCSE and A Level tests, so we need to be preparing our students to be successful in this type of question. I think that the dialogic approach mentioned here is an extremely powerful tool in this quest. It allows us to help students explore their thinking and create their own links. I heard a colleague recently explain to a student that maths was about “finding shortcuts, and finding tricks” this worried me a little at first but then he continued “we all have hundreds of tricks and shortcuts that we have developed over years of doing maths. If Mr Cavadino and I were to teach you our tricks they wouldn’t make sense to you and it would overwhelm you.” I can understand this point – if a student notices that d = s x t can be rearranged simply in a triangle because they understand how to rearrange that equation then they will save themselves time. If they learn the technique without understanding what is taking place they open themselves up to the possibility of more errors. In the article the authors use the term heterodiscoursia, which means legitimate simultaneous diverse discourse. The suggestion is that as part of the dialogic teaching teachers should be allowing discussions and methods to abound and thrive in the classroom. They suggest that this mix of discourses allows students to bounce ideas, allows the teacher to correct any misconceptions and helps build meaning making and engagement. Their suggestions are certainly in line with my observations from my own lessons that have allowed these types of discussion to develop and I think that it would be beneficial to explore how this can be allowed to grow with my other classes. The authors have some practical suggestions for us maths teachers. They suggest that we need to be familiar with the fact that there are often different solutions and be able to develop them. We need to allow the students to frame the question into a context that works for them then use that context to find a solution which is salient, and we need to be able to question our preconceived notion of the solution. This sounds like sound thinking, I feel that these are things we should all do while we are trying to build the problem solving capacity of our students. The authors go on to discuss dialogic pedagogy and how this can in effect allow teachers to discuss the problem almost as a peer – I find that this is a great tool when working with A Level students. If i can find problems that I haven’t done before then I can share my thinking with them and we can work through them together. This has been very successful when developing problem solving strategies. While checking the work of a year 11 student on Friday I came across a question that could have been a great one for the higher GCSE students to practice their skills together and also their selection of which mathematics to use. A great question. One that to you or I is straightforward but that would take GCSE level students and below a bit of thinking and let’s them hone their skills. The way to tackle it is to use Pythagoras’s Theorem to form an equation, solve for x then find the area. I feel is beneficial as it combines Pythagoras’s Theorem with a decent amount of algebra then includes the find the area bit at the end. Which is still a fairly nice form and solve an equation problem. There is a niceness to this question that goes beyond the question itself. It shows us a great way of differentiating within lessons. Just be leaving out a tiny portion of the information, in this case the perimeter, we can make the question much harder. This idea is something I’ve been working on in various places. M1 questions can be made much easier by providing a diagram, for example. Have you used questions in a similar way? If so I’d love to see them, please do get in touch. Is one solution more elegant? Earlier this week I wrote this post on mathematical elegance and whether or not it should have marks awarded to it in A level examinations, then bizarrely the next day in my GCSE class I came across a question that could be answered many ways. In fact it was answered in a few ways by my own students. I like this question, and am going to look at the two ways students attempted it and a third way I think I would have gone for. Before you read in I’d love it if you have a think about how you would go about it and let me know. Before I go into this method I should state that the students weren’t working through the paper, they were completing some booklets I’d made based on questions taken from towards the end of recent exam papers q’s I wanted them to get some practice working on the harder stuff but still be coming at the quite cold (ie not “here’s a booklet on sine and cosine rule, here’s one on vectors,” etc). As these books were mixed the students had calculators and this student hadn’t noticed it was marked up as a non calculator question. He handed me his worked and asked to check he’d got it right. I looked, first he’d used the equation to find points A (3,0) and D (0,6) by subbing 0 in for y and x respectively. 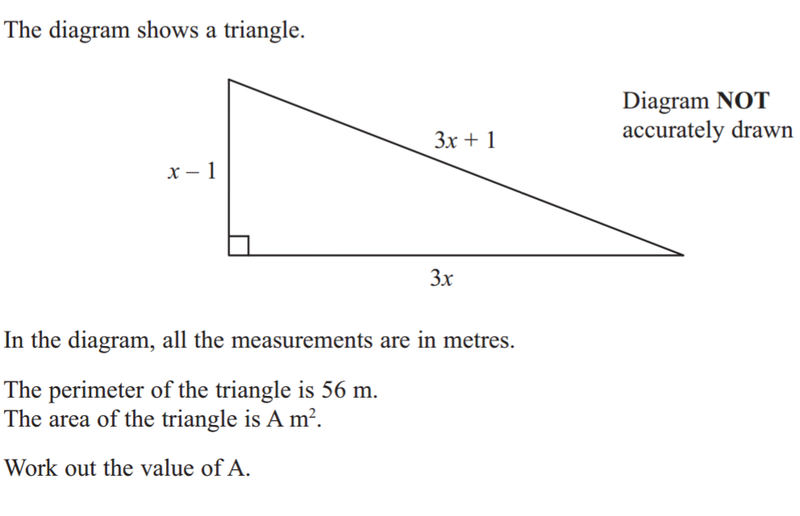 He then used right angled triangle trigonometry to work out the angle OAD, then worked out OAP from 90 – OAD and used trig again to work out OP to be 1.5, thus getting the correct answer of 7.5. I didn’t think about the question too much and I didn’t notice that it was marked as non-calculator either. I just followed his working, saw that it was all correct and all followed itself fine and told him he’d got the correct answer. Literally 2 minutes later another student handed me her working for the same question and asked if it was right, I looked and it was full of algebra. As I looked I had the trigonometry based solution in my head so starter to say “No” but then saw she had the right answer so said “Hang on, maybe”. I read the question fully then looked at her working. She had recognised D as the y intercept of the equation so written (0,6) for that point then had found A by subbing y=0 in to get (3,0). Next she had used the fact that the product of two perpendicular gradients is -1 to work put the gradient of the line through P and A is 1/2. She then used y = x/2 + c and point A (3,0) to calculate c to be -1/2, which she recognised as the Y intercept, hence finding 5he point P (0,-1.5) it then followed that the answer was 7.5. A lovely neat solution I thought, and it got me thinking as to which way was more elegant, and if marks for style would be awarded differently. I also thought about which way I would do it. 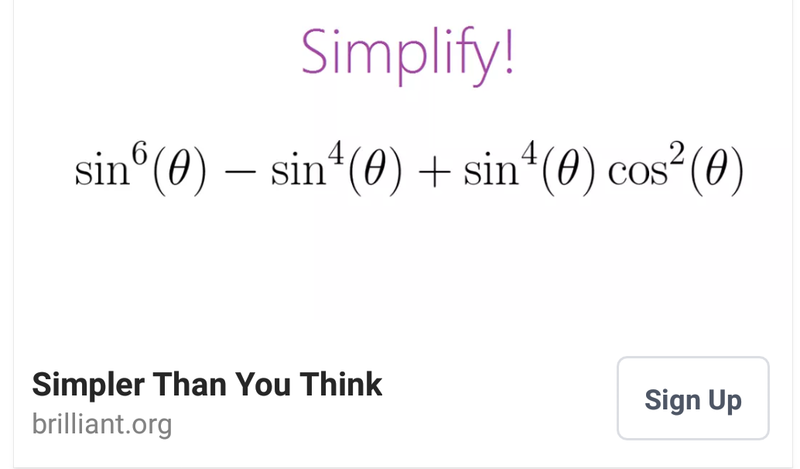 I’m fairly sure that if I was looking at this for the first time I would have initially thought “Trigonometry”, then realised that I can essential bypass the trigonometry bit using similar triangles. 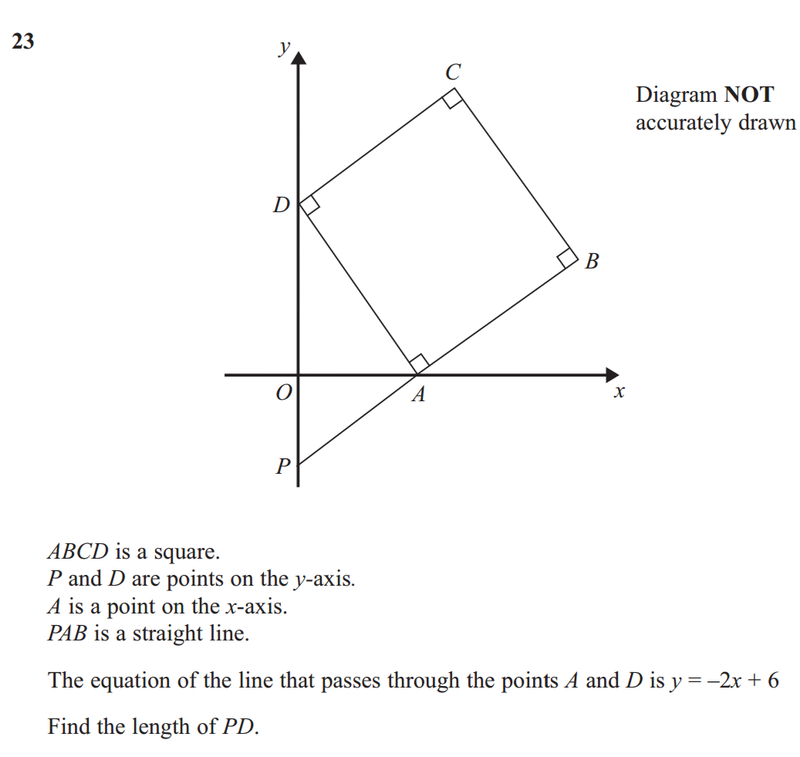 As the axes are perpendicular and PAD is a right angle we can deduce that ODA = OAP and OPA = OAD. This gives us two similar triangles. Using the equation as in both methods above we get the lengths OD = 6 and OA = 3. The length OD in triangle OAD corresponds to the OA in OAP, and OD on OAD corresponds to OP, this means that OP must be half of OA (as OA is half of OD) and is as such 1.5. Thus the length PD is 7.5. This question had me intrigued, so i considered other avenues and came up with Pythagoras’s Theorem. Leading to a final answer of 7.5 again. Another nice solution. I don’t know which I like best, to be honest. When I looked at the rest of the class’s work it appears that Pythagoras’s Theorem was the method that was most popular, followed by trigonometry then similar triangles. No other student had used the perpendicular gradients method. All three methods were there (obviously the trig method was missed due to it being a non calculator paper). I wondered if the ordering of the mark scheme suggested the preference of the exam board, and which solution they find more elegant. I love all the solutions, and although I think similar triangles is the way I’d go at it if OD not seen it, I think I prefer the perpendicular gradients method. Did you consider this? Which way would you do the question? Which way would your students? Do you tuink one is more elegant? Do you think that matters? I’d love to know, and you can tell me in the comments or via social media! Yesterday I read this post from Tom Bennison (@DrBennison). The post was written to start a conversation for a twitter chat that I unfortunately couldn’t make. It did, however, make me think. He was questioning Wetherby mathematical elegance and style should be assessed at A level. Suggesting that solutions with more elegance should be awarded more marks. Bizarrely, the example he used was almost exactly the same as a discussion if had with a year 13 class not long before I read his post. His example was finding the midpoint of a quadratic. He looked at two methods – completing the square and differentiation – and suggested that as CTS is more elegant that should be worth more. I agree immensely that CTS is a preferable method with far more elegance, but I don’t think the marks should be different depending on the method you choose. I feel that we should be encouraging mathematical thought, trying to create young mathematicians who can apply themselves to a problem and find their own way through. I feel if we start assigning marks for elegance and style them we would be moving towards the “guess what’s in my head” style of assessment that I feel we need to be moving away from. The way to do well would be to spot from a question what the examiner wants, rather than to apply the mathematical tools at ones disposal and find a solution. Back to that Y13 lesson I mentioned, we were looking back over some C3 functions work and one of the questions involved finding the range of a quadratic function – so obviously it was necessary to.find the minimum. A discussion ensued as to how to do this with students coming up with 3 valid methods. The two mentioned above, both of which I find quite elegant, although I do much prefer CTS. The third method was suggested by one student who said “it’s -b/a – you just do -b/a” I knew what he meant – he was saying that this was the x value where the minimum occurred and that you put that in to find y, but he didn’t really understand what it was or why. He’d come across the method online and has learned it as a trick. When I showed him it came from completing the square and looking at it as a graph transformation, I saw the light bulb come on. It is an interesting discussion. Some methods are far more elegan, and some are just algorithmic tricks. I think that the lack of understanding with these tricks will lead to marks being lost. So perhaps this will self regulate. 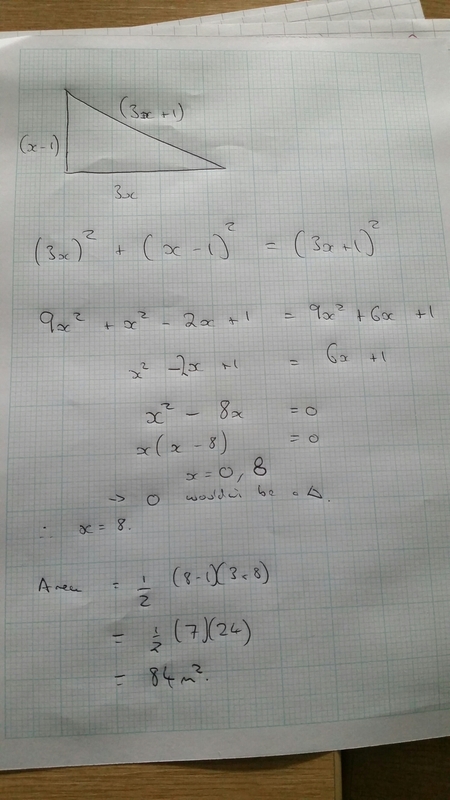 I’d love to hear your views in this, which way would you tackle finding the minimum of a quadratic? And do you think we should assign marks to elegance and style? Sometimes a puzzle can look complicated, but be rather simple (see this geometry puzzle). I love puzzles like this and I particularly like to test them out on classes to try and build their problem solving ability. Just now, I saw the following trig puzzle from brilliant.org and I love it! It’s amazing! My initial thought was, it’s got three terms, it’s bound to be a disguised quadratic that will factorise. A few seconds later I realised that it wasn’t. I saw the – sin^4 and suspected a difference of two squares but then a few seconds later it became clear. A lovely, satisfying, simple answer to a little brain teaser. Hope you liked it as much as I did.